A tasty and healthy soup is a good thing on a day when fall is definitely in the air. We always make turkey stock from the bones and leftovers from a roast turkey dinner and freeze it in half liter plastic containers for later use in soups, stews and for the absolute best gravy when added to the pan drippings of the next roast turkey. This soup makes good use of some of that stock along with some of the leftover turkey to stretch a recent roast turkey dinner into another economical meal. This soup has a nicely flavored, slightly spicy, stock scented with herbs and a little ginger Barley can be substituted for the quinoa if it is not available in your area. Simmer slowly for another 20 minutes or so or until the sweet potatoes are fork tender before serving. 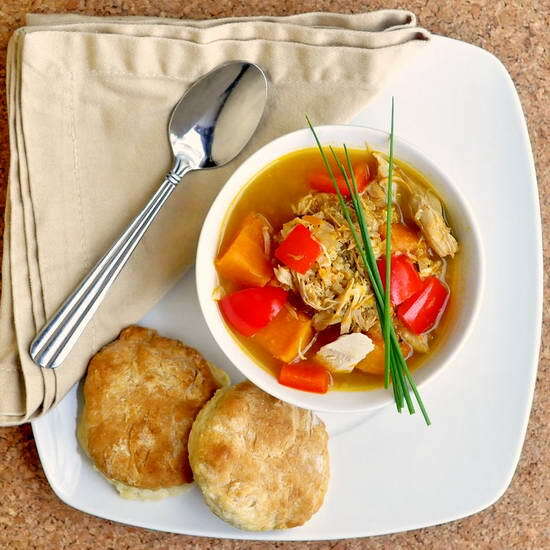 Buttermilk biscuits are nice to serve with this delicious soup.